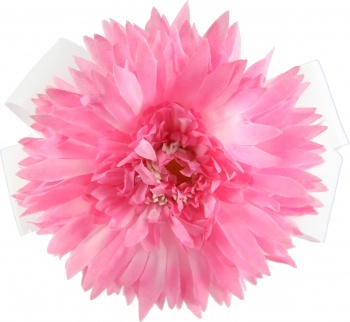 Shown above is a white bow with a large Pink Silk Spiky Daisy Flower on top. The white bow is made of white 1.5" grosgrain ribbon in a boutique style bow. The Daisy is 4.5" circumference and has a bright yellow center with the petals springing out all over. This is a large size flower and with it being on it's own alligator clip can be worn on the side of the head for a lovely dress up piece for any outfit. As you can tell the daisy is as large as the bow.